Thank You for visiting KitchenFacelifts.com, a Division of Sementa Construction, Inc. We are a family owned & operated kitchen remodeling company serving Southwest Florida specializing in Kitchen & Bath Cabinet Refacing & Remodeling. Why Buy Cabinets Again When the Ones You Own Can Be Recycled? If your cabinets are structually sound and the general layout of your kitchen suits your needs, then cabinet refacing may be the kitchen remodeling solution for you which will add beauty and value to your home for years to come. Save time, money & the demolition of a full kitchen remodel by refacing your cabinets. Your existing cabinets can be reused as a foundation for a brand new kitchen. 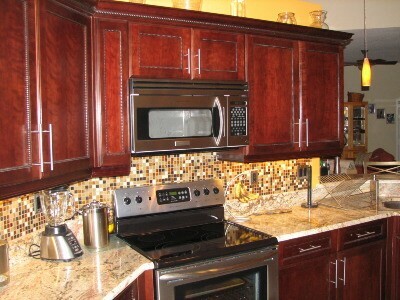 According to a recent CNN headline, kitchen cabinet refacing can bring your kitchen "back to life." Refacing your cabinets and installing new hardware can give an entirely new look to your kitchen, and increase the value of your home in a tough market. We perform cabinet refacing in Southwest Florida in Charlotte County and Lee County including Fort Myers, Naples, Bonita, Estero, and Punta Gorda.